Amir rented a room from John, the main tenant. John wrote the tenancy agreement, which they both signed. The contact was supposed to last 6 months – the period which Amir intended to stay. Unfortunately, John had move out one month before the contract ended, which also forced Amir to move out; remember that John isn’t the landlord here… he’s the “master tenant”. Amir wondered if he could get some compensation out of the premature ending of this agreement, and he found another tenancy agreement that stated that a tenant would be paid to 2 months rent as compensation if a landlord cancelled the contract. Just to make it clear, this article isn’t about sub-letting or tenancy agreements, rather, we’ll be looking at how contracts work and why you should be careful when writing or signing a DIY one. We’re using Amir’s tenancy agreement as a sample contract for purposes of discussion, so you can try to spot problems in the image above if you want to take a crack at it yourself. 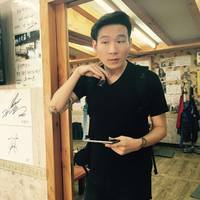 A handwritten contract IS totally valid! By this definition, you actually enter into contracts every day without knowing it. For example, if you order a roti canai for breakfast, a contract is formed when you request for the roti canai (the lawful object), which is given to you in exchange for money (the lawful consideration). If that’s the case though, why do people still insist on going through the hassle of preparing and signing contracts instead of pinkie-promising their way through life? In order to see how a badly-written contract can cause problems down the line, we sent Amir’s contract (with his permission) to practicing lawyer and Asklegal contributor Dinesh Sadhwani to point out some obvious issues. Before you say it, yes – a lot of this will sound like nit-picking. Understandably, some of you might roll your eyes and mumble something about lawyers purposefully making life complicated, but it’s also worthwhile keeping in mind that a contract doesn’t matter when things are going smoothly… it only matters when things go wrong. If John didn’t have to move out, the contract would have quietly expired without an issue and this article would never be written. From the contract, we know that Amir is obligated to pay RM450/month in order to live in the space. However, it doesn’t mention WHEN he needs to pay it. Having said this, it doesn’t mean that you’ll be continuously trolled by your tenant just because you forgot to specify the payment period. The Contracts Act provides a stipulation that, if no specific time is specified, the performance of the promise (in this case paying rent) must be done within a reasonable time frame. However, given the subjectivity, this still begs the question (and can trigger an argument) as to what constitutes "reasonable time". No landlord (or master tenant in this case) wants to have their stuff broken, so most tenancy agreements would include a clause that fixtures need to be taken care of. In this case, Amir has to take care of the furniture and mattress during the time he’s living there, or risk losing his deposit. If you read the contract closely, the forfeiture of the deposit seems to be very specific i.e. in respect of damage caused to the furniture and mattress. The phrase "furniture" may be sufficient to cover cupboards, chairs, desks and the like, but there may be other items in the room which are arguably not covered by this definition (e.g. glass window or heater for the shower). But it doesn’t end here. Even for the items specifically mentioned (the furniture and mattress) as being within Amir’s responsibility, the question will arise as to what will happen if, for example, Amir was given an old mattress that falls apart the first time he sleeps on it. 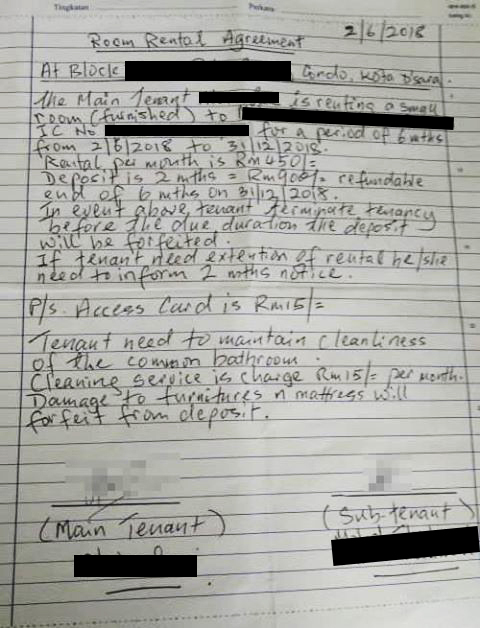 The landlord will obviously try to push the responsibility/liability to Amir (“It’s in the contract!”), even though it wasn’t due to Amir’s fault or negligence. Amir could counter-argue that it’s an implied warranty that the mattress will be in good condition – but again, there is no clear-cut answer and can become a point of argument. This, by the way, is also why tenants are always asked to inspect the fixtures before they sign a tenancy agreement. Along with taking care of the fixtures, Amir also has to keep the common bathroom clean for the comfort of everyone who uses it. If he doesn’t, he’ll be…be… what? Dinesh clarifies that it can be argued that the cleaning service charge of RM15/month in the next line is the implied penalty, but it can be pretty contentious due to the wording, since there’s no clear connection between the two. In other words, this is the equivalent of a TV show trope where one character says “You’d better do it, or else.” and the other character cockily replies “Or else what?”. TLDR; Whether you’re signing or writing a DIY contract, it’ll be to your best benefit to write down the obvious to avoid any problems in interpretation down the line, even if it’s something that would make sense without being said. Does this mean you always need to hire a lawyer to write a contract? Despite everything you’ve just read, the answer to this is actually no. Other than writing your own contract, you can also use template or sample contracts downloaded from the internet. At the end of the day, it’s the responsibility of both parties to discuss and properly understand the terms before signing. READ the contract! – Once signed, a contract is legally binding – and claiming that you “didn’t know” or “didn’t understand” cannot be used as an excuse. Don’t be afraid to ask for changes – You can always negotiate and/or suggest changes if you find certain terms unfair or unfavorable, as long as you haven’t signed it. Remember that your ability to negotiate is also determined by bargaining power. Get a third party to look through the contract – A neutral third party may spot problems or loopholes that you missed out. You can also get a lawyer to go through it for a nominal fee. Don’t DIY the important stuff – If the agreement is going to involve a lot of money or a long period of time where situations might change… you’ll probably want to leave the contract writing to the pros. Don’t fully trust a sample from internet or a template – These may still contain clauses that are unrelated or may be from a different country altogether. 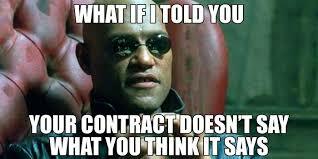 Lastly, don't assume or accept that there are "standard" contracts - despite what anyone might tell you. “ Contracts are usually assumed or accepted by laypersons as standard because the majority of us lack bargaining power to negotiate the typical significant contracts we sign (real estate purchases, car purchases, bank loans, etc).